In 1937 a 22-year-old actor took on the task of adapting Victor Hugo's immense novel, Les Misérables, as his debut radio play script. This young actor's name was Orson Welles and his script was the very first to ever use narration in a radio play. 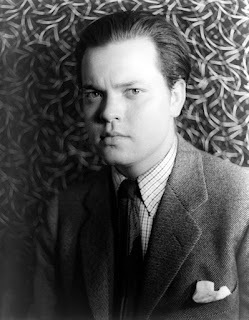 Welles adapted the beloved story of redemption into a series of seven half hour episodes which he also produced and directed as well as starring in the leading role of Jean Valjean. This production is still considered by some critics to be one of Orson Welles finest achievements which was followed a year later by his groundbreaking radio adaptation of H.G. Wells' novel The War of the Worlds; perhaps the broadcast for which he is most well known. The cast of Welles' production of Les Misérables included Martin Gabel as Javert and Alice Frost as Fantine who also costarred with Welles in his stage adaptation of Shakespeare's Julius Caesar* just a few months later. 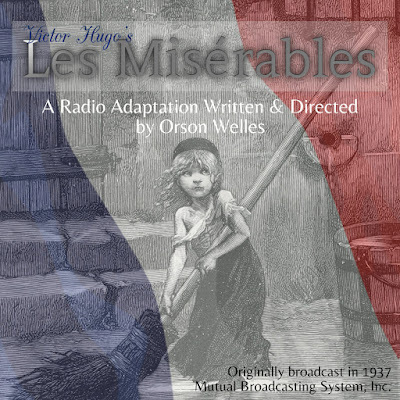 Les Misérables was originally broadcast for seven consecutive Fridays on the Mutual Broadcast System from July 23 to September 3, 1937. This broadcast was the precursor to (and possibly the impetus for) Welles' program The Mercury Theatre on the Air which began airing on July 11, 1938. Les Misérables was recorded at the WOR studios in New York City and after the broadcast aired the recordings were set aside for nearly three decades. They were almost lost forever when they were discarded in 1966, but thanks to an archivist named David Goldin who rescued them, we can now enjoy this historic audio drama production today. For those of you who are wondering how this adaptation compares to the Focus on the Family Radio Theatre version of Les Misérables let me just say that that's an apples to oranges comparison. They each have their place, in my opinion, and each has elements that I like better in one over the other. For example, there are some scenes in the Welles' version which do not appear the Radio Theatre adaptation; on the other hand, Radio Theatre has a stunning musical score composed by Jared DePasquale while Welles' version has very sparse music. I think that if you love this story then you'll likely enjoy both of them. And you may be interested to know that there are a handful of other audio adaptations including a 1-hour Lux Radio Theater version from 1952. The supporting cast included Agnes Moorehead, Adelaide Klein, Everett Sloane, Betty Garde, Hiram Sherman, Frank Readick, Peggy Allenby, Richard Widmark, Richard Wilson and William Alland. Music by Milton Katims. You can listen to the 7-part series via the player below or download a .zip file of the episodes to your computer. You may also open the playlist in a new window by clicking here.